911 Emergency Autonomous Call Center Acknowledgement Client Technical Documentation - Emergency Phone Service for community alerts and warnings. This section of our technical library presents information and documentation relating to Emergency Notification Systems and Disaster Recovery Applications. If a severe snow storm hits your area, your community can be notified of school closings or event cancellations. Should an emergency arise in your community, our emergency broadcast phone service can deliver large volumes of phone messages quickly using thousands of digital and analog phone lines simultaneously. If a dangerous chemical spill occurs in your community, you can target specific areas to call. 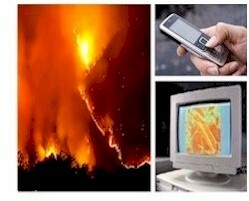 In the event of a blizzard, wild fire or devastating flood, your community can be notified quickly given specific instructions if an evacuation is required using our emergency broadcasting service. 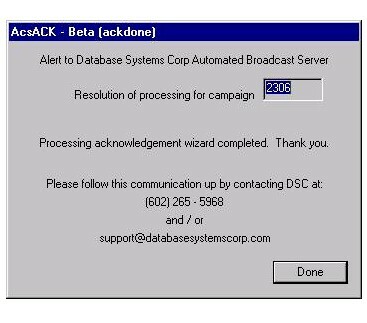 Following is a quick summary of the purpose, configuration and flow of the Autonomous Call Center Acknowledgement Client (Page 1) (AcsACK). 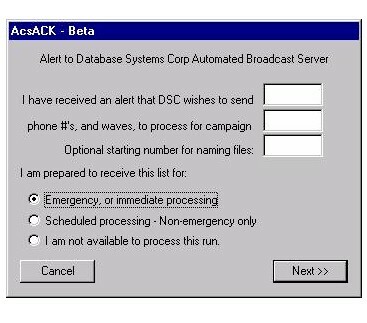 AcsACK has been created to facilitate a manual acknowledgement to the automated emergency or non-emergency phone number and wave distribution server (DscACS) at a remote location (e.g., here at DSC). The successful receipt of phone lists and wave files. The success or failure of a run. The optional upload of unprocessed numbers in case of partial failure. The upload of the report statistics for the run. 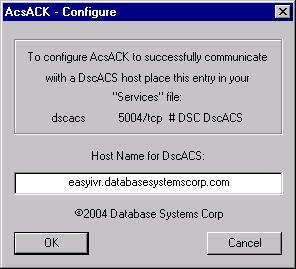 Please use the AcsACK client to respond to this request for upload. For further information, contact DSC at (602)265-5968. When AcsACK is invoked, the user is presented with the first screen (Figure 2,) from which the readiness and availability to process this upload may be indicated. The user now sits at the second screen (Figure 2-a or 2-b, depending on the emergency status.) After the upload, the user reviews the files to make sure that the result matches the ftp document, and then indicates the accuracy and readiness to proceed. If there was a problem with the upload, the user may request a retry, in which case Screen 2 will reappear, or decline processing and proceed to Screen 8. 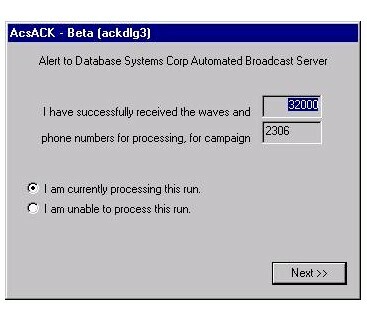 If all is OK for continuing, and depending on whether it is and emergency run or not, the user will be taken to Screen 3 (non-emergency) or Screen 4 to indicate the final success / failure status of the run. 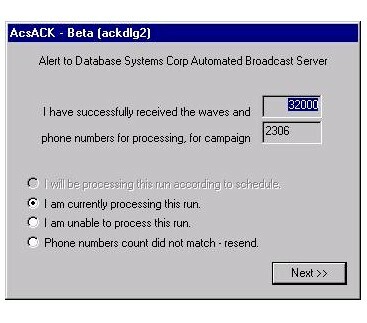 This screen (Figure 3) appearing only on non-emergency runs, gives the opportunity to opt-out of the processing for whatever internal reason (go to Screen 8), or remains on the user�s desktop until run processing begins. If continuing, then the user will be taken to Screen 4, to indicate the final success / failure status of the run. The user sits at this screen until the end of the run. 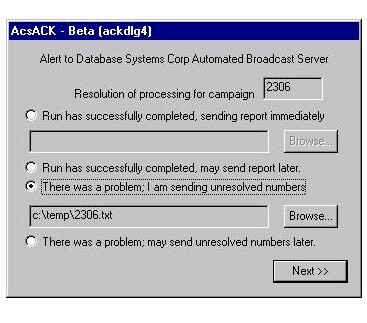 Following the run, the user now has four options for this screen. 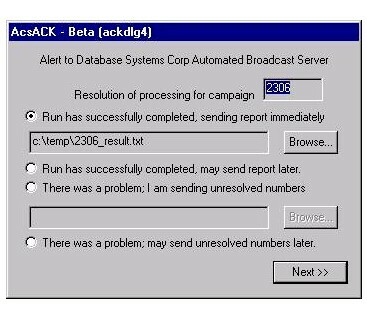 �Run has successfully completed, sending report immediately� (Figure 4-a). User will be taken to Screen 6, where he is given one more opportunity to upload the report immediately. 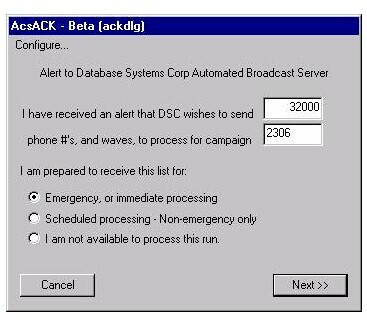 This option is provided so that the DscACS server can be quickly alerted as to the success of the run while report data is being gathered / moved. �There was a problem; I am sending unresolved numbers� (Figure 4-b). 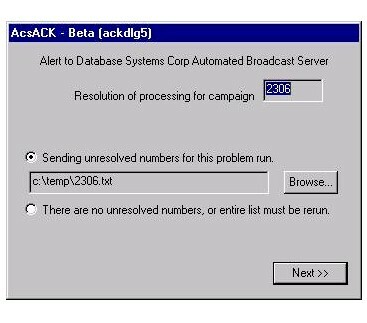 For a partially successful run the user may upload a list of any unresolved phone numbers that require further processing. Will be taken to Screen 6, where is given the opportunity to upload the status of those numbers that have been successfully processed. User may optionally upload any unresolved phone numbers here (Figure 5.) If the entire run is compromised, or if unable to upload, then the user may indicate so here. User will be taken to Screen 6 for optional report upload. Here is one last opportunity for the user to send a report (Figure 6.) User will be taken to the final screen, Screen 7. 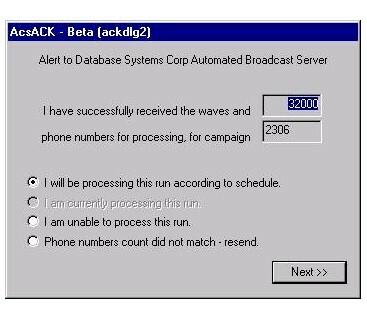 This is the final, farewell screen, which invites the user to follow up with phone or email information regarding the status of this run. In the event that we agree on a naming convention involving sequential numbers, the user will be given the opportunity to enter the beginning number in that series (alternate Screen 1 � Figure 1-A.) All wave files, and their corresponding phone list files, will be named in sequential increments starting with the number indicated here.